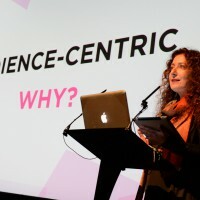 In the second article looking back at Power to the Pixel’s London Forum, Michael Gubbins asks about the next steps for those wishing to embrace cross-media change. A survey commissioned for next week’s Screenwriters Festival in Cheltenham revealed that more than 70% of writers questioned worked more than 10 hours per week on their feature film idea and nearly 40% more than 20 hours. And the fruits of this extraordinary labour for nearly 70% of those correspondents? Nothing, not a penny. Just over 4% were making what might be called a decent wage. It begs the question ‘why?’ – a question that could be asked of many of those working in the current system of finance, production and distribution. The answer, of course, is that many have bought into the whole notion of the dream factory, inspired perhaps by riches, red carpets, statuettes or of being, figuratively speaking, up there on the ’68 barricades with Godard. The cross-media approach to content creation is essentially about doing rather than dreaming. 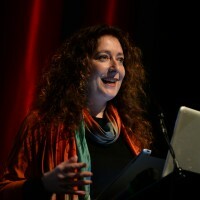 Cut through an alarming number of acronyms and jargon (a habit that surely needs shaking), and the film-makers, games developers, storytellers etc at Power to the Pixel are essentially engaged in circumventing creaking industry systems and media limitations to find their way directly to interact with the audience. What they are doing is the antithesis of the hit-and-hope culture of film. For multi award-winning US producer Ted Hope, this makes cross-media work exciting – allowing the reinvention rather than replacement of cinema. Film-makers need to reach out and take responsibility for a much greater part of the process. The question is how. What Hope and all the delegates at the forum were offering film-makers and other content creators is an invitation to grasp opportunities. The message was that the future is not something that happens to you but something that you can help shape. Whether cross-media change is characterised as evolutionary or revolutionary – an extension of existing business or the development of new creative forms – it is about action; indeed Power to the Pixel did not spend a second talking about when the existing industry might “recover”, which has been the obsession of many media conferences this year. But taking control instead of waiting is not always comfortable. Even those who have embraced the potential of cross-media film-making recognise that the task can appear daunting at the outset. Cross-media work certainly seems to demand a change of perspective and to learn new skills outside the industrial disciplines of any single media. The key to acquiring these skills according the speakers – and it was a strong commitment at the Think Tank – is in sharing knowledge and ideas. The roots of many of the cross-media pioneers are in open-source software and web networks, where collaboration is simply the dominant culture. 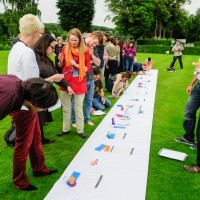 A generous sharing of ideas and tools and a commitment to democratising processes is characteristic of cross-media work. That is partly because those on the stage are real pioneers in areas of work where no rules have been written. There is also a basic instinct to freely publish and share. There is a bigger picture though. In the current film industry with its limited potential for distribution, film-makers are in competition. For all the talk of culture, film is often a fight for elbow room on a crowded, heavily-policed route to the customer. Cross-media with its much broader distribution is a fight, not with each other, but for a share of audience time. In such a world, mutual interest outweighs competition and so film-makers will find easy access to knowledge. The truth is that reskilling is not the hard bit. It is the collaborative means of working that represents the real culture shock. Power to the Pixel posits a world in which business models are based on interaction. There is no comfortable hiding place – this is a world that begins with that missing link of the traditional film industry – transparency. In the final part of the review, we will look at what the Pixel Pitch of new projects tells us about the future, the questions raised at the Think Tank and a conclusion about the direction of the cross-media movement.